Dazzling Host Review 2019: Is Dazzling Host a Good Hosting? Dazzling Host is an American web hosting vendor established in 2013. Its reasonably priced hosting plans are delivered from centers in the U.S., the U.K., the Netherlands, and Romania. 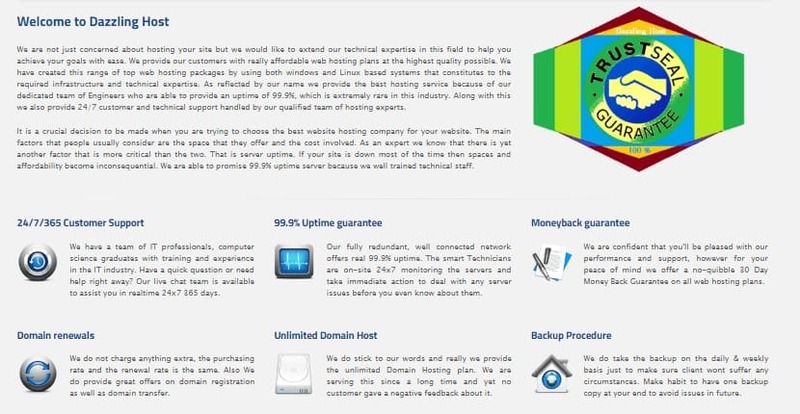 Web hosting company Dazzling Host has offered affordable hosting plans since 2013. This vendor provides an array of internet solutions that touch on technology, consulting, and outsourcing. With data centers located in the U.S., the U.K., the Netherlands, and Romania, this vendor has grown fast to have customers in more than 50 countries. Dazzling Host offers a variety of hosting solutions such as shared hosting, reseller hosting, VPS servers, cloud hosting and dedicated hosting via their easy-to-navigate, user-friendly website. Dazzling Host has invested heavily in modern data centers located in several countries around the world, with each server being connected to a 1 Gbps switch port for high-speed networking. They use SSL encryption to protect your website from possible loss, alteration, and misuse of information. What’s more, the vendor has put up a firewall and is DDoS protected. Dazzling Host performs daily and weekly backups. Their incremental backups could theoretically leave you high and dry if one of the incremental backups fails (or becomes corrupted) and then the entire chain is lost. This vendor has been providing unlimited storage space for a long time, and their unlimited bandwidth policy ensures standard and e-commerce websites are not billed for exceeding allocated bandwidth usage. However, the bandwidth policy does not cover certain kinds of websites such as web portals, image galleries, online gaming, downloads, chat, and audio/video streaming websites. Dazzling Host’s hosting plans are reasonably priced and come packed with an array of premium features including free domain transfer and registration. Customers have the option of paying for hosting on a monthly or an annual basis, and they also offer a 30-day money-back guarantee. The uptime guarantee of 99.9% is backed by a pro rata compensation scheme that should pay out in the event of network server downtime. Customers can contact Dazzling Host technical support 24/7/365 via email, live chat, ticketing system or social media channels like Facebook and Twitter. There is no support phone number, and live chat conversations are limited to general enquiries, so you have to open a ticket or send an email for specific support queries. Dazzling Host’s knowledge base is packed with dozens of articles and tutorials that guide webmasters toward making the most of their hosting platform, but there are no video tutorials. In just over five years, Dazzling Host has attracted a large number of hosting customers from more than 50 countries around the globe, and there is every indication that they are not about to slow down. Wondering how Dazzling Host stacks up against other Web Hosting companies? Enter any other Web Hosting company and we will give you a side-by-side comparison.